A planning application for a new A284 Lyminster Bypass is due to be submitted this summer. 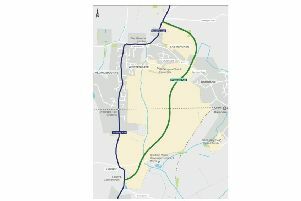 West Sussex County Council is intending to deliver the northern 1.1km section from Toddington Nurseries northwards, with the southern section being delivered separately by developers. The approved budget for the scheme is £9.3m, of which £3m is being funded by the Coast to Capital Local Enterprise Partnership, £3.8m from developer contributions and £2.6m directly by the county council. A planning application is due to be submitted this summer. Jackson Civil Engineering were awarded the contract to deliver the scheme by the county council in 2016. The scheme would see a single-carriageway built with a shared cycle and pedestrian route along one side, with a new T-junction linking the existing A284 to the proposed bypass. According to a county council report the north-south link is important for residents and businesses to improve accessibility and connectivity between the A27 at Crossbush and Littlehampton. A previous application for a bypass scheme, submitted in 2015, was then withdrawn in 2016.